Samuel Adams and Craft Brewing Pioneer, Jack McAuliffe Rebrew Original New Albion Ale. After 30 Years, Samuel Adams is Reviving This Iconic American Craft Brew for a Limited Release. Boston, MA – Jack McAuliffe, a pioneer in craft brewing and founder of The New Albion Brewing Company, and Jim Koch, brewer and founder of Samuel Adams announced today their plans to brew McAuliff’s original New Albion Ale for the first time in 30 years. Recognized by beer experts as the original American craft beer, this American pale ale will be brewed true to its original recipe using the original yeast, which has been carefully preserved at the University of California since 1977. Koch and McAuliffe both share an enormous passion for craft beer and are seen as pioneers in the American Craft Beer Revolution. McAuliffe, a Navy veteran, acquired a taste for flavorful beer while stationed in Scotland in the 1960s. Shortly thereafter he developed a passion for homebrewing and eventually started the nation’s first craft brewery, The New Albion Brewing Company in 1976. Although the brewery closed its doors in 1982 due to a weak economy and a lack of financing options, McAuliffe’s vision for New Albion Ale was ahead of his time, helping pave the way for other American craft breweries, and its impact is still felt today. Samuel Adams is brewing the original recipe for McAuliffe’s flagship beer, New Albion Ale. McAuliffe traveled to Boston in early July to join Koch and the Samuel Adams brewers as they brewed the first batch. New Albion Ale is a deep, golden beer brewed with American Cascade hops and a 2-row malt blend. The Cascade hops, sourced from the Pacific Northwest, create a moderate hop bitterness and lingering notes of citrus and floral, balanced by the upfront cereal character and sweet finish from the malt. When McAuliffe decided to turn his passion for homebrewing into a microbrewery, it was one of the first of its kind. At its height, New Albion Brewing Company brewed about 450 barrels annually. Microbreweries struggled under a market dominated by mass domestic beer but paved the way for growth in the 1990s. The number of craft breweries has gone from 8 in 1980, to 537 in 1994, to close to 2000 in 2012. Jim Koch and Jack McAuliffe share the same pioneering spirit, and like McAuliffe, Koch was convinced that he could find his niche in an uncharted beer market. 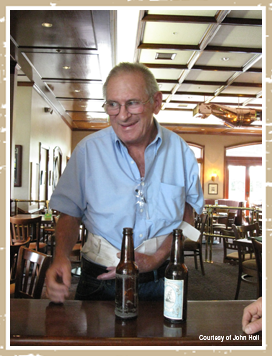 Koch followed his German- American family tradition and became a brewer, creating the first batch of Samuel Adams Boston Lager® in his kitchen in 1984 from a family recipe. He insisted then, as he does now, that only the world’s finest ingredients will make the best beer, and that quality and flavor are the only standards worth pursuing. Jim wanted a beer brewed with American craftsmanship and pride. New Albion Ale will be brewed, bottled and sold by The Boston Beer Company. All profits will go directly to Jack McAuliffe. The beer will be served at special events during the 2012 Great American Beer Festival (October 13), in Denver, CO and available nationwide beginning in January of 2013. New Albion Ale will be available in six-packs with a suggested retail price of $7.99. Today, The Boston Beer Company brews more than 50 styles of beer. It relentlessly pursues the development of new styles and the perfection of classic beers by searching the world for the finest ingredients. Using the traditional four vessel brewing process, the Company often takes extra steps like dry-hopping, barrel-aging and a secondary fermentation known as krausening. The Company has also pioneered another revolution, the ‘extreme beer’ movement, where it seeks to challenge drinker’s perceptions of what beer can be. The Boston Beer Company has been committed to elevating the image of American craft beer by entering festivals and competitions around the globe, and in the past five years has won more awards in international beer competitions than any other brewery in the world. As an independent company, brewing quality beer remains its single focus. Although Samuel Adams beer is America’s largest-selling craft beer, it accounts for only one percent of the U.S. beer market. The Boston Beer Company will continue its independently-minded quest to brew great beer and to advocate for the growth of craft beer across America. For more information, please visit www.samueladams.com.